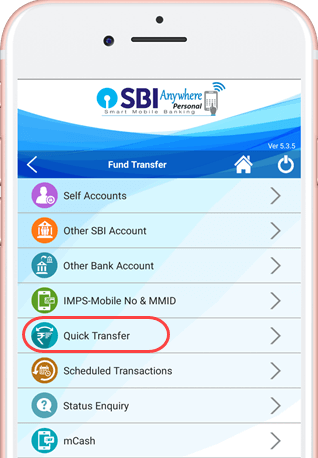 State Bank Anywhere – is State Bank of India’s official mobile banking application available on Android, Windows Phone, iOS. You can do many things related to bank account on your Smartphone. There are many things for which you will not have to go to the bank. If you are a customer of SBI, then definitely use this application and you can avoid frequent visit in the bank. Well, today I am telling you – how to send maximum Rs.10,000 instantly to any bank account through State bank Anywhere application. 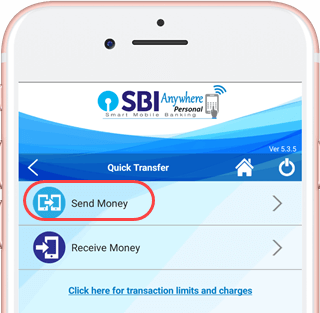 Suppose a member of your household is in another city and urgent needs some money then you can use SBI Anywhere to send money to his/her account. 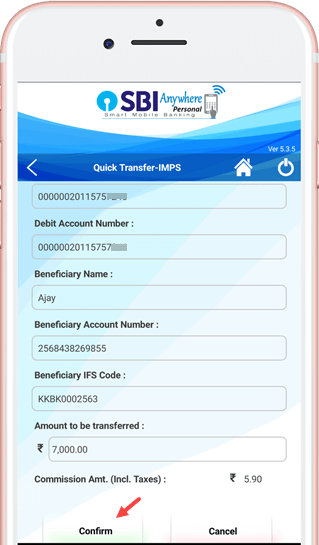 Many times we face such situation when we have to send money immediately to someone’s bank account, in such situation you can follow this method to send money at anytime. So let us see how you can send up to 10,000 to anybody on SBI Anywhere. First of all, you have to turn on Internet Banking facility for your bank account. In today’s digital era, you must have Net banking facility. In order to start Internet Banking, you just have to go to the bank and fill out a small form, the bank will give you the User ID and password, which allows you to log in to the Net Banking account and do all the banking activities. Once you have started Internet banking, you can use SBI Anywhere. 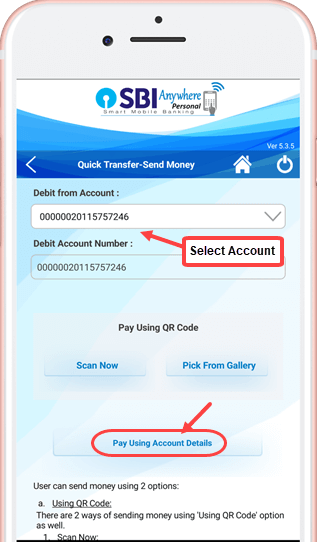 Install the application in your phone and after the validation process is completed for the first time, you are ready to log in to SBI Anywhere. So let me assume you have Net Banking and you are ready to send money from SBI Anywhere. 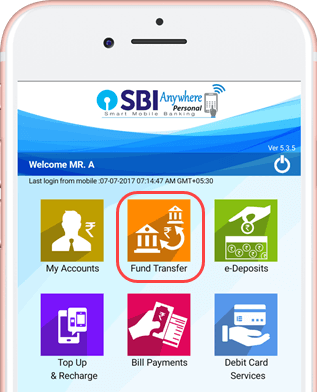 1 First open the SBI Anywhere application and login. 2 After you login, you have to tap on Fund transfer. 3 In Fund transfer, you can see many options for online Money transfer. Here you have to tap on the Quick transfer. 4 Now you have to tap Send Money on the next screen. 5 Now in the next screen you have to select your account, and then tap on “Pay Using Account Details“. 6 In the next screen you have to enter the account details of the person (Beneficiary) and enter the amount which you are sending. Beneficiary Name: Type the name of the person whom you are sending money. Beneficiary IFSC code: Type his/her bank IFSC code. Amount to transfer: Enter the amount you want to send. 7 Tap on Confirm in the next screen and confirm transaction. Now your registered mobile number will get an OTP password that you type in the next screen. That’s it you have successfully send money to beneficiary’s account. Your money will be credited to his/her account immediately in a few seconds. So friends, now whenever you have to send money something below 10,000 in urgent, you can try this facility. If the bank gives you such a nice facility then you will have to pay some charge for maintenance, which is very nominal. 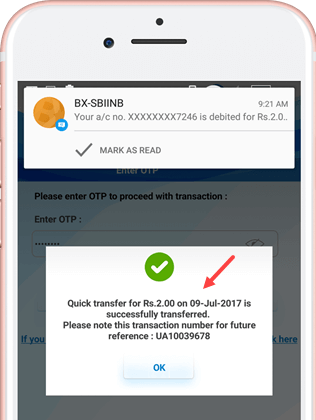 Well if you are sending money from SBI to SBI, you can add the person as a beneficiary and then you can send money by selecting another SBI account option in the fund transfer. You will not get any charge in this. SBI To SBI Fund transfer is free.